Food, Entertainment & Fun For The Whole Family. The Yiasou Greek Festival began in 1978 and since then has become one of Charlotte’s largest cultural events. It is eagerly anticipated by the Charlotte community each year. The Yiasou (the Greek word for Hello, Goodbye and Cheers) Greek Festival features Hellenic cultural exhibits, authentic Greek cuisine and homemade pastries, entertainment, live music and dancing, wine tastings, art, shopping and more. 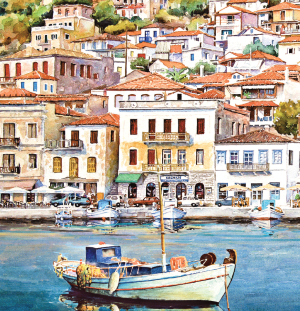 Experience the sights and sounds of Greece when you visit the Annual Yiasou Greek Festival. It’s a time of the year when everyone can be Greek! Holy Trinity Greek Orthodox Cathedral is offering an Advertising Program which will allow your company to participate as a sponsor for the Yiasou Greek Festival. We are offering each member of Holy Trinity the opportunity to make a contribution in the amount of $50.00 as a PATRON of the Yiasou Greek Festival. Your Help Is Needed. Please Volunteer Today! PUT ON YOUR CALENDAR NOW! CATS/Bus/Lynx Light Rail – The Festival is less than a mile from the East/West Boulevard Lynx station. Visitors who ride the CATS/Bus/Lynx Light Rail to the festival receive free admission when they show their same-day stamped ticket. In partnership with the Charlotte Housing Authority (CHA) at 400 East Boulevard in Charlotte, Yiasou Greek Festival patrons and volunteers may park free at the CHA surface lot (NOT in the parking deck) after 5:00 PM Friday, all day Saturday, and all day Sunday. Side street parking is available on nearby Dilworth neighboring streets, adhere to posted parking guidelines. And, please do not block any driveways.